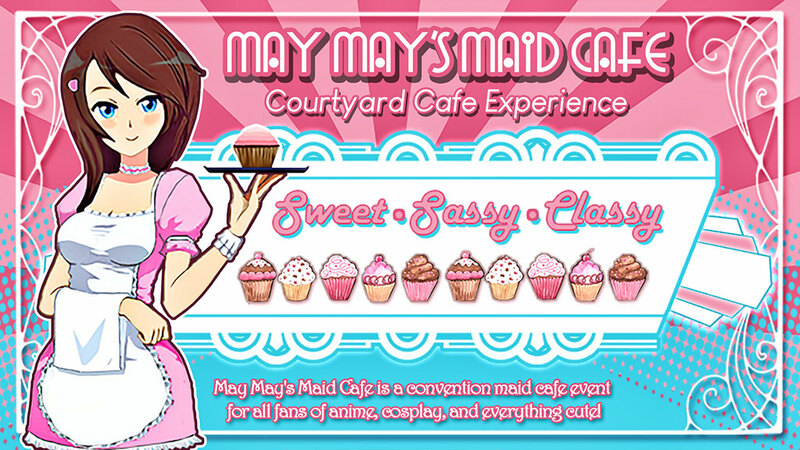 MAY MAY'S MAID CAFÉ Courtyard Café Experience - Presented by The Kawaii Company! May May's Maid Café is place where cute Maids and Butlers service and entertain. Evolved from the concept of cosplay restaurants, our maid event will features staff dressed up in maid/butler costumes. Our hosts provide an array of entertainment for their Goshujin-sama (Masters) to enjoy, such as interactive games, group dances, musical performances, photo ops, etc. If you're interested in customer service, cosplay or Moe (cute) culture, this is the experience for you! May May's Maid Café Courtyard Café Experience takes place in an outdoor only courtyard area that will allow you to meet our members, socialize, and enjoy refreshments with our maids and butlers. 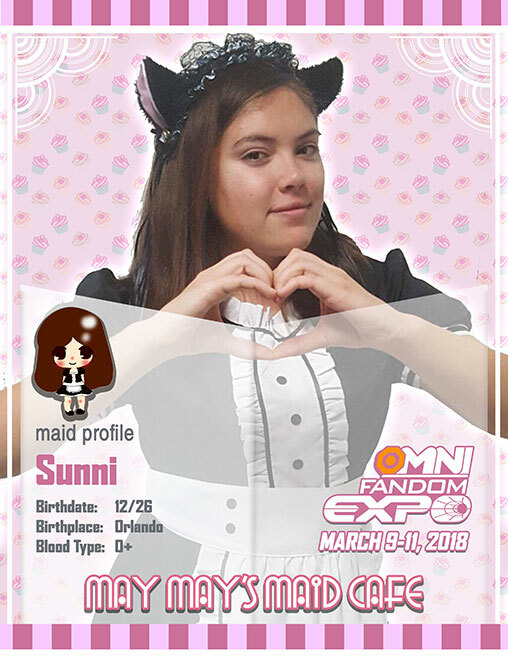 May May's Maid Cafe TM is excited to announce an amazing giveaway this year at Omni Fandom Expo 2018! We would like to invite you to our table at the courtyard to take part in our contest in which we will be giving away a brand new Amazon Fire Stick, 2 grab boxes, and cute journals. More items could be added as well. Entries are done on a raffle system. Entrants MUST provide their phone number and/or email to be reached live at the convention for the drawing. Entries will be accepted up until Sat 6:59 pm and the winner will be notified via provided contact info. The winner has 30 minutes to respond for the Amazon Fire Stick before a new one will be drawn small prizes will continue until prizes are gone. Winner MUST provide either the verification text/email to claim the prize. Be considerate to those who are around you. Disturbance around you are strictly provided removal of guest(s)from the café, without refund/reimbursement will happen. Exchanging of personal information both in and out of cafe hours is also strictly provided and will result in black listing of guest(s). Physical contact without our Maids/ Butlers consent or harassment of any kind is strictly provided with result in removal without a refund/reimbursement and be black listed. You must have a Current, Valid OMNI FANDOM EXPO 2018 badge or wristband to attend any events. PLEASE NOTE: Again, violation of ANY rules will result in being black listed with not refund! What is the Courtyard Café Experience? Our event is outside with refreshment and entertainment. Ending with photography with our maid's/butler's and their special charm. Be treated like a master at May May's Maid Café Courtyard Café Experience. Is the Courtyard Café Experience separate ticketed event? Our dining is open seating. You may purchase refreshment and photos at the event. We accept both cash and credit/debit cards. Will there be more information posted about things going on during the event before OMNI FANDOM EXPO? 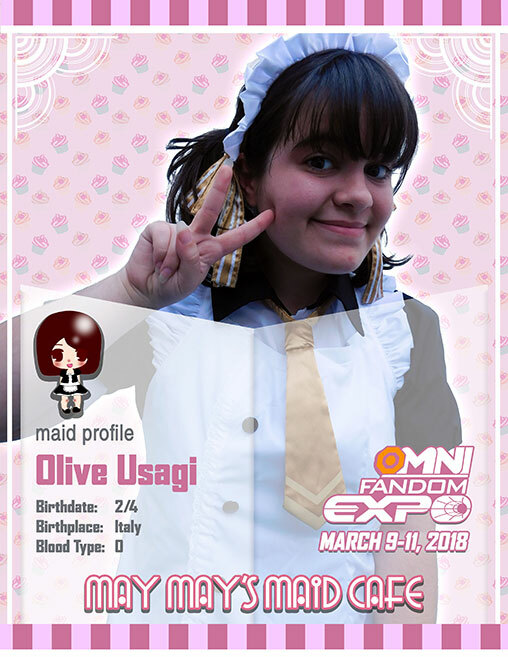 Do I have to have a OMNI FANDOM EXPO convention pass to get into any of the May May's Maid Cafe events? Yes. 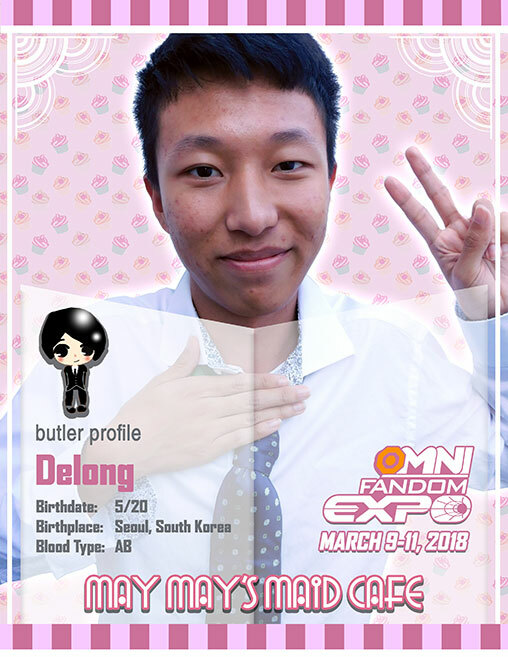 You must have a valid OMNI FANDOM EXPO 2018 pass to gain entry into the Cafe. Does having an OMNI FANDOM EXPO VIP/ Hotel pass get me into the Court Yard Café Experience for discount? What other panels are we hosting? We will be hosting several one hour shows to give you a taste of what our outdoor cafe is like. My group got split up! That's not fair! We are sorry, but depending on how many large groups there are, we may not be able to accommodate them at only one table. Can I get kicked out of the May May's Maid Cafe if I don't behave? Yes. Anyone can be removed if necessary for breaking rules and/or causing a disturbance. You will not be reimbursed for your ticket if this happens. Can I take my own pictures inside May May's Maid Café Event? We are sorry, but you may not take pictures of our hosts during the show. Yes. Patrons are more than welcome to cosplay. Please no oversized costumes though. Your cosplay and normal clothes are fine also. What if I have a questions? Can I write in and ask about it? Yes. Please feel free to write us at chiefmay0315@gmail.com.